Shostakovich & Kabalevsky Cello Sonatas is an outstanding recital centred around three figures (Prokofiev being the third) whose personal and professional associations, for good and ill, intertwine throughout the fraught history of Soviet music. 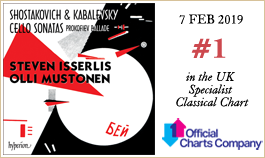 Treading in the footsteps of the great Russian cellists of the past, Steven Isserlis (in tandem with regular duo partner Olli Mustonen) delivers a Record of the Month for February certain to be recognized as one of his most important performances. The strange, increasingly rarefied worlds of Liszt's Années de pèlerinage, troisième année & other late piano works demand sympathetic pianism—and pianists—of the highest order. 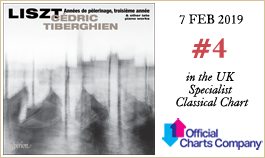 Cédric Tiberghien is clearly of their number; these are unforgettable accounts of this extraordinary music. The Leonore Piano Trio is acquiring a well-deserved reputation for championing unjustly neglected byways of the repertoire, and accomplished recordings of Parry Piano Trios Nos 1 & 3 look set to continue this happy state of affairs. Choral music this month comes courtesy of Peter Phillips, making a welcome guest appearance on Hyperion with the Spanish vocal ensemble of which he is Director Honorífico, El León de Oro. 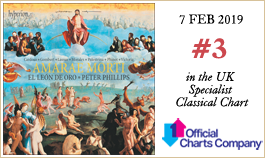 The programme, Amarae morti, is a guide through some of the finest, if perhaps lesser-known, music from Renaissance Europe, mapping a spiritual journey from out of the depths of Phinot's Lamentations to the exultant heights of Laudate pueri in Palestrina's joyous setting. And finally from Hyperion, a reissue of Martinů's Complete music for violin and orchestra from Bohuslav Matoušek, with the Czech Philharmonic Orchestra under the much-missed Christopher Hogwood. 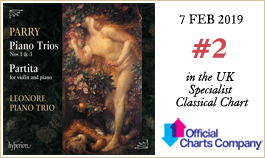 Now at super-budget price, this four-CD set offers the perfect opportunity to explore these luminously scored, life-affirming works in impeccably idiomatic accounts. From Signum Classics this month a new release presents Will Todd's Passion Music & Jazz Missa Brevis, the composer directing vocalist Shaneeka Simon and the St Martin's Voices and ensemble through these new takes on familiar themes.